Introducing, the world’s first Oak Bottle, an oak vessel that accelerates the traditional oak aging process and allows anyone to customize their favorite wine, spirits, beer or cocktails by infusing extravagant oak aged flavors and aroma in a matter of hours not years. 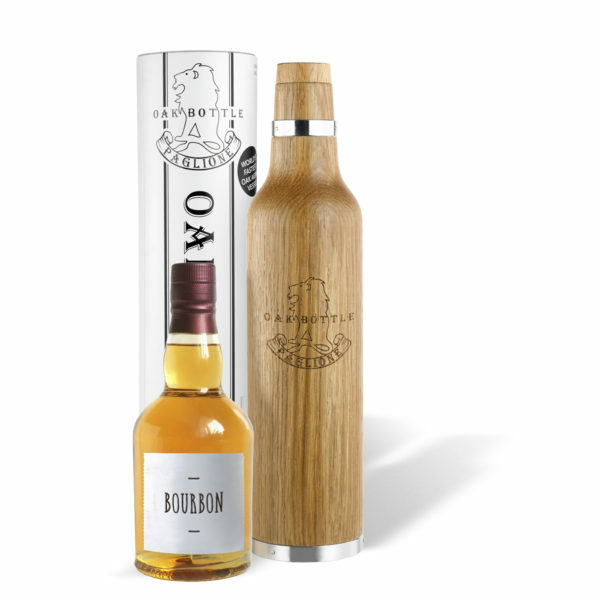 A special Oak Bottle that has been preconditioned with Bourbon so that you can add rich smokey vanilla notes of Bourbon in your favorite spirit, wine, beer or cocktail. This is the Original size at 750ml. Includes: 1 Bourbon Conditioned Oak Bottle, 1 etched cork top, barrel wax, 1 coaster, 1 batch ID tag, and retail tube packaging.